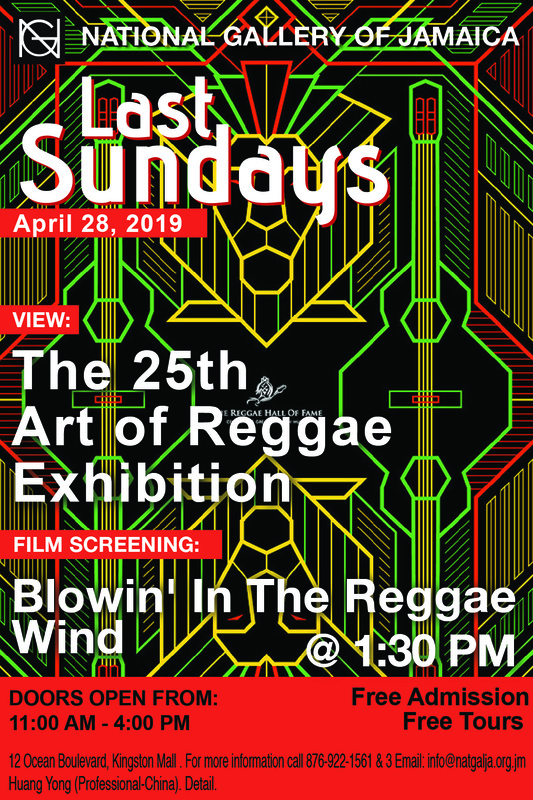 The National Gallery of Jamaica’s Last Sundays programming for April 28, 2019 will feature a film screening of Blowin’In The Reggae Wind. On view will be The 25th Art of Reggae Exhibition, displaying the winner and top 100 entries for the International Reggae Poster Contest (IRPC) and a tribute to Lawrence Edwards. The National Gallery of Jamaica will be open from 11:00 am to 4:00 pm, with the film screening beginning at 1:30 p.m. As per usual on Last Sundays, admission is free, but contributions to our Donations Box, located in the lobby, are appreciated. These donations help to fund our in house exhibitions and our Last Sundays programming. The National Gallery’s Gift Shop and Coffee Shop will be open for business. The National Gallery of Jamaica’s Last Sundays programming for March 31, 2019 will feature the Pimento Band as well as the winner and top 100 entries for the International Reggae Poster Contest (IRPC) in The 25th Art of Reggae Exhibition. There will also be a speech by IRPC founder Maria Papaefstathiou and IRPC board member Carolyn Cooper. The 25th Art of Reggae Exhibition is hosted by the IRPC, which was founded in 2011 by Michael Thompson (1958-2016) and Maria Papaefstathiou. The contest aims to highlight positive Reggae music and the impact it has had around the globe. The long term goal is to create a Kingston based Reggae Hall of Fame museum and performance centre that wil facilitate and celebrate Reggae. In addition to that IRPC aims gain support for the Alpha Boys School, an vocational institution located in Kingston. It was founded in 1880 by the Sisters of Mercy. It is geared towards underprivileged youth and has been home to many notable Reggae artists such as Yellowman and Desmond Dekker. Born in Athens, Greece, Maria Papaefstathiou is a graphic designer who has been practicing since 1996. Her main focus and research is in poster design. She is the founder and editor of the blog Graphic Art News where she selects high quality international works including designs, illustrations and art to teach and inspire other designers. Graphic Art News has been known to be used an educational tool to many. A Jamaican author and scholar, Prof. Carolyn Cooper is a consultant on culture and development. A woman of many accolades, Cooper received a scholarship to complete her B.A in English at UWI, Mona and fellowships to complete bother M.A and PhD at the University of Toronto. She has authored the books Sound Clash: Jamaican Dancehall Culture at Large (2004) and Noises in the Blood: Orality, Gender and the ‘Vulgar’ Body of Jamaican Popular Culture (1993). She also initiated the International Reggae Studies Centre at UWI. The reception will feature a special musical performance by the Pimento Band. The band, though only a little over a year old, features musicians with over thirty years of experience in the local and international music scenes. The roster includes Leebert “Gibby” Morrison, bass player on Peter Tosh’s album’s Mama Africa and the Grammy award winning No Nuclear War, Orlando “Lando” Bolt of the Live Wyya Band, and past student of Alpha Boys Everol “Stingwray” Wray who has been featured on the album The Miseducation of Lauren Hill. The bands repertoire ranges from Ska to Reggae to a style they have dubbed progressive Mento. The National Gallery of Jamaica will be open from 11:00 am to 4:00 pm, with the Pimento Band’s performance beginning at 1:30 p.m. As per usual on Last Sundays, admission is free, but contributions to our Donations Box, located in the lobby, are appreciated. These donations help to fund our in house exhibitions and our Last Sundays programming. The National Gallery’s Gift Shop and Coffee Shop will be open for business. On Saturday February 23, 2019 the National Gallery of Jamaica will be hosting a film screening of The Secret Life of Your Clothes as part of our programming for Beyond Fashion. Following the screening will be a related artist talk moderated by Assistant Curator and co-curator of the exhibition Shawna-Lee Tai. Participants in the Artist Talk will include Ayana Rivière, who is represented in the exhibition, and Nigerian artist Alao Omotoya. The documentary The Secret Life of Your Clothes is a Firecrest Films Production for BBC’s “This World”, and is directed by Andy Wells and presented Ade Adepitan. The documentary is about the obroni wawu (secondhand clothing) industry in Ghana and how it has not only turned the clothes donated to charity into a profitable business, but has inversely impacted the traditional clothing industry as well as deeper cultural issues. Ayana Rivière, born in Port of Spain, Trinidad, has a passion for clothing design. She completed a degree in Criminal Justice from Coppin University and then pursued her love for fashion. She has worked as a wardrobe stylist on numerous music videos, films, commercials and advertising campaigns within Jamaican and the Caribbean such as the [PUMA in Cuba] campaign and Idris Elba’s Yardie. Her piece Ray Ray (2018) in Beyond Fashion speaks closely to the topic of the film in a Jamaican context. Alao Luqman Omotoya is a Nigerian artist with a BFA in painting from the University of Lagos, an MFA in printmaking from the University of Benin, and is currently doing his PhD there as well. He is a member of the Society of Nigerian Artist (SNA) and a member of the Arts Council of the African Studies Association (ACASA). He is a Cultural diplomat in Jamaica working with the Tourism Product Development Company (TPDC), Ministry of Tourism Jamaica, and currently with Jamaica Business Development Corporation (JBDC) and Ministry of Culture. The screening will begin at 1:30pm and entry is free to the public. As always, the Giftshop and Coffee Shop will be open for business. The National Gallery of Jamaica’s Last Sundays programming for February 24, 2019 will feature Tribe Sankofa as well as tours of our current exhibition, Beyond Fashion. We will also have on display the winner and entries for the International Reggae Poster Competition in The Art of Reggae Exhibition and the five finalists of the Government of Jamaica Houses of Parliament Design Competition. February marks both Black History and Reggae month. It is a month that acknowledges and honours the achievements of black people throughout history and despite immense racial adversity. It is also a month that celebrates reggae music and it’s contribution to the development of Jamaica, musically, culturally and economically. With this in mind this Last Sundays will feature two new exhibitions. The Art of Reggae Exhibition is hosted by the Reggae Poster Contest. The Reggae Poster Contest was founded in 2011 by Michael Thompson and Maria Papaefstathiou and aims to highlight reggae around the globe, create a locally based Reggae Hall of Fame museum and gain support for the Alpha Boys School. The second phase of the Government of Jamaica Houses of Parliament Design Compettition is being hosted at the National Gallery of Jamaica. Patrons may view the proposals, site models and renderings of the top 5 finalists until February 28, 2019. The competition stipulates that at least 50% of each team be of Jamaican heritage or citizenship and, as such, the new House of Parliament will not only be a place where decisions regarding the Jamaican people are made, but a place created by it’s people. There is also a People’s Choice Award where citizens are encouraged to vote on the design of their choice. Tribe Sankofa is a performing arts collective formed by Fabian Thomas. It is a vibrant and eclectic group of multi-talented performers who combine their artistry to add an exciting new dimension to the performing arts landscape of locally and internationally. Their niche is “….borrowed and original spoken word/poetry, soulful song-styling uniquely blended with other visual and performing arts”. Tribe Sankofa has shared their unique offerings in diverse spaces including the Poetry Society of Jamaica, Bookophilia, Lignum Vitae Awards, Gungo Walk Alternative Music and Arts Festival, Arts in the Park and the Investiture of the Poet Laureate of Jamaica to name a few. In addition to multiple medals and awards at Tallawah Dramatic Arts Festival and the Jamaica Cultural Development’s Speech and Drama competitions, the collective has also staged its own productions: Black Bodies, A Tribe Ting and their signature annual production Word Soul. This Last Sundays Tribe Sankofa presents BLACKness (an every month thing) ‘A celebration of blackness, spoken, sung and felt’. The National Gallery of Jamaica will be open from 11:00 am to 4:00 pm, with Tribe Sankofa’s performance beginning at 1:30 p.m. As per usual on Last Sundays, admission is free, but contributions to our Donations Box, located in the lobby, are appreciated. These donations help to fund exhibitions like Beyond Fashion and our Last Sundays programming. The National Gallery’s Gift Shop and Coffee Shop will be open for business. The exhibition is open to all artists resident in Jamaica, Jamaican artists resident abroad and artists of direct Jamaican parentage living abroad. Artists submitting works from overseas should submit digital photographs of and proposals for the works they wish to enter. Final submissions should be appropriately framed or mounted. This Tuesday February 12, 2019 the National Gallery of Jamaica (NGJ) will be opening the 25th Art of Reggae Exhibition held by the International Reggae Poster Contest (IRPC). At the NGJ, we will have the top 100 designs on view, in addition to the winning 2018 entry by Vinicio Sejas of Bolivia. The posters in this exhibition will give an expansive view of how reggae may be interpreted and represented from a variety of perspectives. The IRPC was founded in 2011 by graphic designers Michael Thompson (1958-2016) and Maria Papaefstathiou. The contest aims to highlight how widespread and impactful reggae has become across the globe. Its long term aim, is to construct a Reggae Hall of Fame museum and performance centre in Kingston, Jamaica that lauds Jamaican music in all it’s capacities, forms and iterations. Another major goal of the IRPC is to raise awareness and support for the Alpha Boys School, which has produced a number of notable reggae icons such as artists Desmond Dekker, Yellowman and Don Drummond of the Skatalites. The IRPC believes that the school should become a template for other vocational institutions of its kind.